Yesterday I went to Campione and discovered the book, ‘The road overlooking the lake’ (2013) that explains the brave enterprise of the project of the road realized by the engineer-geologist Arturo Cozzaglio in 1913. When I came home, back to the Hotel Riviera, I spoke with Milena and she gave me a copy of this book. So after breakfast I looked at the beautiful black and white historic pictures of the Negri Archive that illustrate this text which is written in Italian, but it is so rich in pictures of the road that leads to Tremosine. that one could read it through the images. After dinner, knowing that the distance is not so far, I decided to take my car and headed towards the Tremosine Harbour. 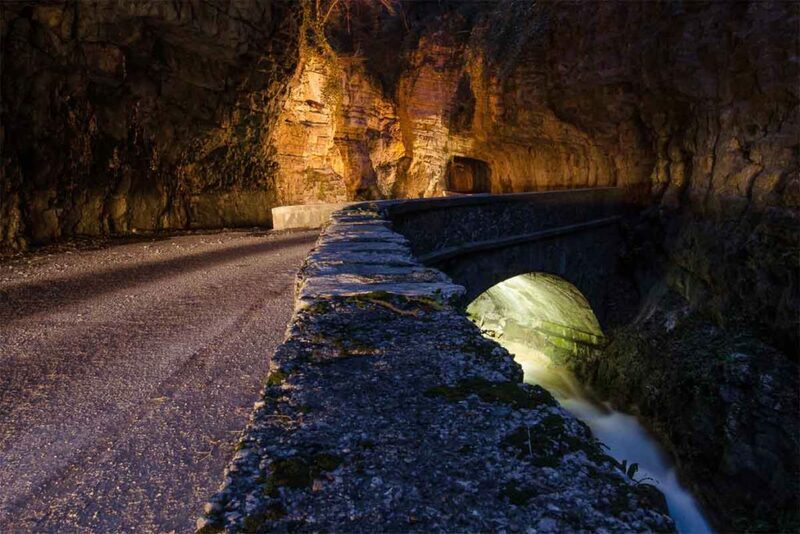 It is only a 4 km distance from Limone, before reaching Campione, at a point where the road turns right towards Pieve. It is 8 p.m. but not dark yet as in the summer the evenings are longer. I am wondering if the road after 100 years had changed that much. After the first tunnel the road gets narrower, still opens at a curve and enters into another modern tunnel – after this the road gets narrower still but really fascinating. At a certain point it enters a cleft, at night it is really spectacular as the rock above me is lit up. I stopped the car on the side of the road and looked up at the illuminated cleft and it gives me a shiver, a surreal impression overtakes me with a mixture of fear, surprise and beauty highlighted by the sound of water everywhere. The water flows slowly in the nearby river but also further on above a little bridge, there is darkness, the lit up rock, water and simply peace. I went back to my car and drove on to reach Pieve, where I was the day before, so I stopped and had a glass of prosecco looking at the lake which from this point looks wide and large like a sea towards the south but like a narrow fjord towards the north. I drove back to the Hotel Rivera in Limone, the same way that I came, as I wanted to see the road by driving down and to imprint these images on my mind. I had to go back and read the book again. Hence, once in the hotel I had another drink and moved straight onto the balcony of my room……..I was wondering, on the way back: how could people reach those places up in the mountain before the road was built in 1913? I discovered that there used to be several aerial ropeways, the first was the ‘Berasi cable’ between Pieve and Tremosine harbour; another one connected Campione and Pieve and another one was called the ‘Cozzaglio cable’ (1907-1931). There used to be another cable between Forbisicle and the curve of Gardola in Tignale, in fact the only way to bring the post to Tignale was by boat from Gargnano the ‘Prà de la Fam’ location (which is the place where there is a lemon grove on the lake before reaching the road to Tignale -here there used to be a little harbour). All these places between Gargnano and Riva could be reached only by boat as the Gardesana road was built in 1931. One can read more information about the GARDESANA ROAD on this website.